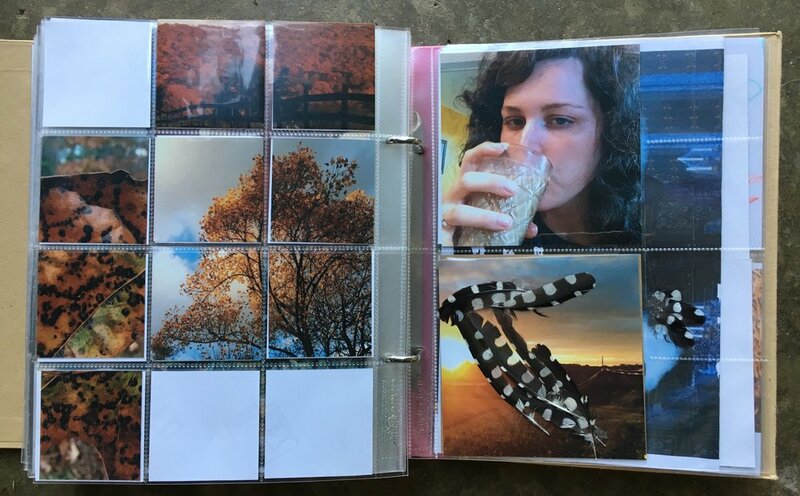 The idea of combining art journaling and scrapbooking came up on the Get Messy Art Journal Facebook page this morning and I realized I should share some of my scrapbooks on here. My scrapbooking approach is honestly super casual. I do not focus on the weeks or months of the year. I sort of try to keep the photos in chronological order but they really aren't. Each album represents one calendar year and I just try to adhere to that. As the year goes by I save scraps of papers, memorabilia like flyers and invitations, letters, cards, art trash, anything paper-ish that I would otherwise throw out. I just throw it all into a big mailing envelope. Also I order prints off my iPhone like once or twice a year. I buy the 8x10 pocket scrapbooking sleeves from Michael's along with whichever corresponding albums they have. I love the plastic sleeves because of all the different arrangements of squares and rectangles. Every once in a while I sit down with my paper cutter and supplies and I fill in the pocket pages rather mindlessly. I cut down the scraps and photos in ways that please me. As I feel compelled to I might write a little caption to explain a photo. The result is photos of my year juxtaposed with mixed media and art journaling pieces and drawings. I love these books. They take me right back to the time the photos were taken and I am reminded of what I was working on artistically at the time. Just photos cut to fit the sleeves with one hand-written caption. These were some drawings I had no plans for so I just cut them down to size and put them in my scrapbook. I remember I drew Mike's and my feet from a cell phone picture. Just photos on these pages. Some pink translucent paper over that photo of me. I like to use washi tape to tape photos onto the correct sized paper sometimes. That selfie was from the day after my wedding. I was so exhausted and I was glad to be in West Virginia with a glass of sweet coffee. Those are some pretty feathers tucked in, too. Oh and on the left you can see how "unfinished" the page is. Oh well! I point that out to reiterate that this is a fun, casual, imperfect activity. The point is not that it is great, but that it gets done and Mike and I can look back at this when we are old. A note from when Mike planted me a wizard tree in Brentwood. Photos of artwork, an envelope from a friend, a program from my sisters play. All just crammed into a plastic sleeve. Old photo of my dad playing the saw over some drawings. So yeah, that's my scrapbook approach. I am very behind at this point. I need to finish 2015, and I haven't started 2016. I've got everything in an envelope, just gotta sit down and do it, which is the fun part.